The live-action adaptation of the classic children's book is coming to Blu-ray in February. In an early announcement to retailers, Universal is preparing 'Dr. 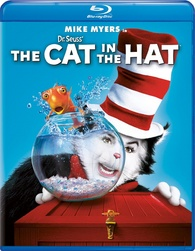 Seuss' The Cat in the Hat' starring Mike Myers for Blu-ray on February 7. Grab a place on the couch, or go find a seat. For you're in for a wonderful Dr. Seuss treat! The Cat in the Hat who goes by that name, is played by Mike Myers of comedy fame! It starts with two kids on a cold, cold wet day. Their mom is at work and they've no games to play! Then in walks the fun in the form of a Cat, who pulls out the laughs from the brim of his hat. Things really get wild when the Cat and his crew (who go by the name of Thing One and Thing Two), Take over the house of Conrad and Sally -- In this fine family film that's right up your alley! The Blu-ray will feature 1080p video, a DTS-HD Master Audio 5.1 soundtrack, and supplements include: Audio Commentary with Alec Baldwin and Bo Welch, deleted scenes, outtakes, Dance-A-Long with The Cat, and twelve behind-the-scenes featurettes. You can find the latest specs for 'Dr. Seuss' The Cat in the Hat' linked from our Blu-ray Release Schedule, where it's indexed under February 7.